Man With A Steel Frame | Fourth Dimension Inc.
A living example of integrity. An inspiring story of a young, honest and courageous administrator and a role model of integrity for all young men and women. By refusing to take bribes, the Madurai collector has earned 18 transfers in 20 years, a modest house and bank balance but lots of respect. On a hot summer afternoon, on Madurai’s busy main road, the district collector, U. Sagayam, saw a young man talking on a cellphone while riding a motorbike. He asked his driver to wave the man down, got down from his car and meted out instant punishment: plant 10 saplings within 24 hours. Somewhat unconventional justice, some might say. But that’s how Sagayam works. Two years ago, as district collector of Namakkal, he voluntarily declared his assets: a bank balance of Rs 7172 and a house in Madurai worth Rs 9 lakh. Once, when his baby daughter, Yalini, who had breathing problems, was suddenly taken ill, he did not have the Rs 5000 needed for admitting her to a private hospital. At that time he was deputy commissioner (excise) in Coimbatore and there were 650 liquor licences to be given out. The going bribe for each was rumoured to be Rs 10,000. Sagayam’s Masters degrees in social work and law come in useful in his role as an administrator. He knows the rulebooks in detail and is not afraid of using them, however powerful the opponent. No wonder then that Sagayam’s career is marked with the scars of countless battles. When errant village officers ganged up to get Sagayam transferred, people protested and the order was rescinded. When he was in Kanchipuram as revenue officer, he took on the sand mafia, ordering them to stop dredging sand from the Palar riverbed. Large-scale dredging had made the area flood-prone. The mafia sent goons to assault Sagayam, but he did not budge and would not take back the order. He also took on a mighty soft-drink MNC when a consumer showed him a bottle with dirt floating in it. He sealed the bottling unit and banned the sale of the soft drink in the city. In Chennai, he locked horns with a restaurant chain and recovered four acres valued at some Rs 200 crore. With such credentials, it wasn’t surprising for him to be picked by the Election Commission to oversee elections in Madurai, as famous for its temples as its political gods. In the last polls, Sagayam took on MK Azhagiri, MP, son of DMK supremo Karunanidhi. He conducted voter awareness campaigns in colleges; the DMK petitioned the court twice, seeking to end what it said was an attempt to influence voters, but the court demurred. While driving to a village, he found a 92-year-old woman cleaning rice. She said she had to work in order to eat. He immediately sanctioned Rs 1000 as old-age pension for her. When 60-year-old Vellamma met him during a tour of Uthappanaikkanoor village this week and asked him to grant her a pension, he said, “I can do that. But do you want me to send your son to jail too – for abandoning you?” He said it with a smile, as a joke, but he has in fact taken action against children who don’t take care of their aging parents. “I believe, as Gandhiji said, that India lives in her villages,” says Sagayam, who also idolises Subhash Bose. His years as a collector – he has slept overnight in village schools many times have convinced him to better the lot of villagers by strengthening the village administrative officer (VAO) system. Many VAOs never visit villages and stay miles away from where they should be, in cities. In Namakkal, his action against errant VAOs had them ganging up with politicians to get him transferred. Over 5000 villagers protested; they wouldn’t let Sagayam go. The politicians had to retreat. 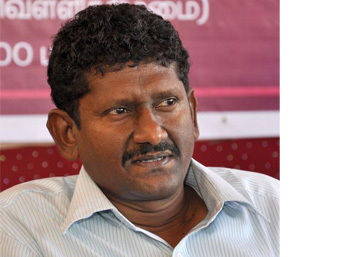 Sagayam says he learnt honesty on his mother’s knees. He is the youngest of four sons of a Pudukottai farmer. “Our adjoining field had mango trees; my friends and I would pick the fallen fruit,” he says. “But my mother made me throw the mangoes away, saying I should enjoy only what is mine.” His daughter Yalini wants to be a collector. When she has an argument with her brother Arun, she asks her father, “Is he really your son? He just told a lie!” Both of them are proud of their father. Recently, after a long time, the Sagayam family went on a holiday to Kullu in H.P. While visiting a gurudwara, a stranger came up to their father and asked him, “Aren’t you IAS officer Mr Sagayam?” Yalini and Arun have not stopped beaming.